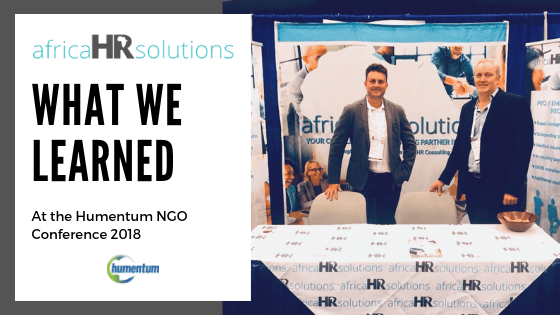 Africa HR Solutions is proud to have attended the 2018 Humentum NGO conference in Washington DC, United States last month. It was our second time attending the annual conference, after a successful first visit in 2017. The Humentum Annual Conference is an exclusive, members-only event. One of the largest gatherings worldwide of professionals in the international relief and development NGO community. The conference is held at the Walter E. Washington Convention Center annually. Located in the exhibitors hall, Africa HR Solutions was there in full-force ready to engage and talk with as many as NGO or Non-profit companies as possible, with the sole aim of helping them in Africa with HR compliance and mobility. Amongst an array of service providers in the hall, we had to differentiate ourselves and our services. Africa was the focus and the discussion point; there were other companies present who offer services, related to ours, on a global perspective. Our PEO and payroll solutions allow companies and organizations to run a project and employ workers without the need to register an entity in Africa. We heard stories of some people who had invested substantial resources in countries to run a short-term project and employ a handful workers, which proved to be a mammoth and tedious task. Had they known about our quick and effortless onboarding solutions, they would not have hesitated to call on us. With an onboarding time of 2 weeks and a small and affordable fixed monthly fee, it is possible to outsource your employment compliance to us in 48 countries in Africa. It’s simple and effective and is the reason why we are already helping over 40 NGOs in Africa. We also had chance to meet many of our existing clients at the Humentum Conference. It was rewarding to hear such positive feedback on how we have helped, especially in the aid sector. Whether it was an immigration solution and work permit, an Employer of record and payroll solution, or simply just giving advice and information on tax laws, our clients rightfully see us as an expert solution-provider in Africa. This expertise is mainly due to the fact that we focus exclusively on the African continent. After several years in business, we have dealt with a vast amount of complicated labor law policies, tedious compliance regulations and language differences. The outcome of all these years is a sharpened and efficient set of of solutions, aimed at making it easier for anyone from a first world country to step into Africa. Hearing good stories from our clients such as Village Reach, Encompass, Palladium, Connexus and International Budget Organization is confirmation that we are in the right place doing the right thing. To discover how we can help you in Africa with the following services, please contact us for a discussion on your next project in Africa.